Across the European Union, women remain underrepresented in the labour market. The economic loss due to the gender employment gap amounts to €370 billion per year 1 . Women are increasingly well qualified and more women than men graduate from universities in Europe but many disappear from the labour market due to their responsibilities as parent or as carer of family relatives. Existing policies have not brought equal opportunities that allow fathers and mothers to work and care together for the welfare of children and society at large. In parallel, the workforce in the European Union is shrinking, the population is ageing and the demographic curve remains a challenge. Lower participation of women in the labour market is linked to a persisting gender pay gap and an increasing pension gap which often leads to social exclusion and an increased risk of poverty. Taking action is not only a question of fairness, gender equality and optimal allocation of skills but also a question of countries' fiscal sustainability. It is both a social and an economic imperative. This initiative has been developed to address this challenge. With this initiative, the Commission presents an ambitious set of legislative and non-legislative actions to modernise the existing European Union legal and policy framework to support better work-life balance for men and women with caring responsibilities and a more equal use of leave and flexible work arrangements. The current EU legal framework for family-related forms of leaves and flexible working arrangements was set in the 1990's 2 . Two decades later we need to draw lessons from the experience gained and the lower than expected progress achieved in equal treatment of women and men on the labour market, while ensuring that this framework is in line with new work patterns and future trends. While addressing women's underrepresentation in the labour market and supporting their career progression through modern work life balance policy, this initiative contributes to the Treaty-based objectives of equality between men and women with regard to labour market opportunities and equal treatment at work. It also helps employers to retain workers, improve the motivation and productivity of employees, reduce absenteeism and avoid wasting talent. Companies should benefit from a wider talent pool and a more diversified workforce. A modern work-life balance policy will contribute to improving employment rates and to reducing poverty and social exclusion, in line with EU priorities reflected in the Europe 2020 targets and with Commission's priorities of jobs and growth outlined in President Juncker's political guidelines. As one of the key deliverables of the European Pillar of Social Rights, this initiative strengthens the social dimension of the Union 3 . It is also part of the implementation of the Commission’s Strategic Engagement for Gender Equality 2016-2019 and of UN Sustainable Development Goal 5 on gender equality. This initiative follows the withdrawal in 2015 of the Commission proposal for a revision of Directive 92/85/EEC on maternity protection, when the Commission committed to present a new initiative taking a broader perspective to improve the lives of working parents and carers. While women across the European Union are increasingly well qualified and tend to out-perform men in terms of educational achievement 4 their participation in the labour market, and hence their economic independence, remains considerably lower than that of men. In 2015, the average employment rate of women aged 20-64 in the EU was of 64.3 %, compared to 75.9% for men (11.6 percentage points gap); the gap reaches an average of 18.1 percentage points when considering full-time employment, taking into account the higher prevalence of part-time work among women. Inadequate measures to reconcile work with care responsibilities tend to impact women disproportionately 8 , with many men discouraged from taking up family-related leaves and flexible working arrangements and many women pushed to leave the labour market or to reduce their working hours. On average, women in the EU are far more likely than men to work part-time (31.3% of women compared to 8.3% of men). At the same time, the digital transformation of the economy is reshaping the way people work and do business, creating new opportunities for remote work, increased autonomy and flexible schedules which can be used better to reconcile work and family commitments. Business models are changing, opening up opportunities and new routes into work. Many sectors are undergoing rapid change and offer new opportunities, with increased possibilities for self-employment and new types of activities 9 , leaving behind the traditional working models. In parallel, Europe's working age population is ageing and shrinking. In the future, the impact of an ageing population will become even more pronounced 10 . According to projections, the EU would move from having four working-age people in 2013 to only two working-age persons by 2060 for every person aged over 65 years 11 . This may have a disproportionate impact on women who are currently more likely to perform the primary role of informal carers to look after ill or elderly relatives. 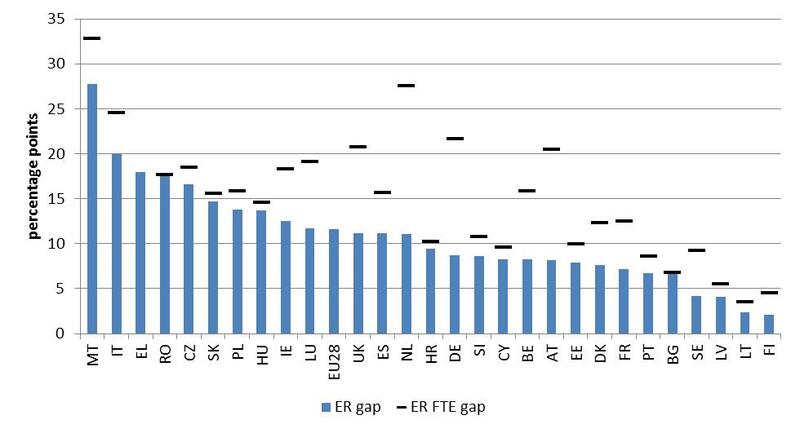 In sum, reduced earnings, higher concentration in part-time work and career gaps linked to caring responsibilities make many women economically more dependent on their partners or the state and contribute substantially to the gender pay gap (on average 16% in the EU) and gender pension gap (on average 40% in the EU). This results in a higher risk of exposure to poverty and social exclusion for women, with negative impacts also extending to their children and families. This evidence on current economic and societal challenges points at the need to better-designed work-life balance policies that facilitate more equal sharing of care responsibilities within couples and remove barriers to women's labour market participation and career advancement. Several factors need to be considered to improve gender equality in the labour market. Global surveys show that both women and men would prefer that women work in paid jobs 12 . Evidence demonstrates that the availability of adequate leave arrangements has a strong influence on female employment. The availability and use of such arrangements for fathers (second parents) also has a considerable impact on participation of women in the labour market as it alleviates some of the care responsibilities of mothers and thus allows for easier return of women to the labour market. Availability of flexible working arrangements – such as telework, flexitime, reduced working hours or job sharing – also plays an important role. Childcare and long-term care, are important tools to remove obstacles to employment, especially for women 13 . The availability, accessibility and affordability of care infrastructure are crucial elements to allow parents and carers to stay on or join the labour market. The EU addresses issues related to gender equality in the labour market and promoting work-life balance through legal provisions 16 , the European Semester of policy coordination 17 , EU funding and policy guidance 18 . In a rapidly changing environment, more needs to be done. To modernise the existing legal framework, the Commission is proposing a directive on work-life balance which will preserve existing rights and build on them with improved and new rights for both women and men. The proposal fully respects the individual freedom of workers and families and does not prevent Member States from providing for higher standards where desired. This initiative also proposes new measures aimed at strengthening the application of the Maternity leave Directive while leaving the rights granted under its provisions intact. The Commission is proposing non-legislative measures to address lack of sufficient or adequate care services or to tackle economic disincentives to work for second earners. It aims to assist Member States in their national reforms and promote a change of mind-sets at organizational and societal level. Evidence shows that legal developments on maternity and parental leave at national level have to a large extent been triggered by EU legislation. Building on the existing acquis, and limiting the burden on businesses (and notably on SMEs), further minimum legal requirements on work-life balance arrangements will help to provide a level-playing field for companies and workers. Only EU level action will address differences between existing national legal provisions, ensure that Member States move in the same direction and foster equality between men and women regarding labour market opportunities. The EU-added value in modernising its acquis is to ensure a minimum level of equal protection for EU citizens, men and women, across the EU. 4. address shortcomings in care services facilities and eliminate economic disincentives to work for second earners. The preparation of the initiative has been informed by an extensive consultation process and an impact assessment of a potential range of legislative and non-legislative measures. The Commission completed a two-stage consultation with the European social partners in 2015 and 2016 19 . There was no agreement among social partners to enter into direct negotiations on the issues raised during the consultations. An open public consultation was also carried out to seek the views of citizens and other stakeholders. The Council held a discussion on work-life balance in December 2015 and the European Parliament adopted a Report on Creating Labour Market Conditions Favourable to Work-Life Balance 20 and a Resolution on a European Pillar of Social Rights 21 . Successful results depend on the commitment of many players including national governments, regions, local authorities, social partners, individual businesses and employees. In particular, the social dialogue will have a key role to play in ensuring this initiative on work-life balance is successfully developed and implemented. This initiative puts forward a package of measures which mutually reinforce each other. In addition to the benefits for workers and their families, the combination of the legal and policy measures will strongly benefit companies and the wider society. The Commission's impact assessment has examined the estimated costs and benefits of the proposed measures on individuals, businesses – especially microbusinesses – and the wider society between 2015– 2055. The analysis showed that, while the costs of the proposed measures, mainly due to lost production, processing applications and replacement costs, arise in the short- to medium-term, in a longer perspective the package represents a limited cost for companies, which should not overburden employers, including those of micro-businesses 22 . As the combination of measures proposed should have positive effects on the fiscal position of Member States, the limited costs on companies can be compensated by targeted interventions at national level to promote a modern work-life balance policy, while fully preserving the competitiveness of businesses. Higher employment rates will also help to address the challenge of demographic ageing and contribute to Member States' financial stability. EU legislation requires Member States to provide for maternity leave and parental leave. Member States can provide for further measures to facilitate work-life balance, improve female labour market participation and more equal gender share of care. The type and content of the measures taken by Member States vary considerably. The EU legislative framework on equality between men and women with regard to labour market opportunities and treatment at work and working conditions does not sufficiently support parents and workers with care responsibilities and its design does not encourage a gender-balanced take-up of available entitlements 23 . The Parental Leave Directive 24 provides for an individual right to four months of parental leave for each parent to take care of a child until he or she is eight years old. One month is non-transferable between parents and the Directive does not foresee obligatory monetary compensation. This encourages mostly second-earners in the household (most often women) to take parental leave and does not sufficiently provide incentives for men. Evidence shows the positive impact of adequate compensation on the take up of leave by fathers' (second parent) 25 , the value of flexible take-up (piece-meal or part-time) and of making it non-transferable between the parents. The proposed Directive preserves the fundamental elements of the Parental Leave Directive and maintains existing rights, including the length of leave and the individual entitlement for each parent. It introduces payment at sick pay level and increased flexibility for taking parental leave, including by extending the age of the child from eight to twelve years where a parent may take parental leave. Four months will be non-transferable between parents. There are currently no specific EU-level provisions on entitlement to paternity leave 26 . Introducing such an entitlement could have a sizeable impact on the sharing of care responsibilities between women and men. Fathers' involvement in childcare gives higher life satisfaction, physical and mental health of caring fathers and higher cognitive and behavioural outcomes for children 27 . Fathers who take paternity leave after the birth of the child are more likely to contribute to the upbringing of their child and to subsequently use their parental leave entitlements. The proposed work-life balance Directive introduces 10 days of paternity leave paid at sick level. The lack of adequate leave to provide care of other dependent relatives exacerbates the unequal sharing of care responsibilities 28 . No EU-level minimum standards exist for workers with dependent relatives, except for a limited right under the Parental Leave Directive to take time off on grounds of force majeure for urgent and unexpected family reasons 29 . The proposed directive introduces such an individual entitlement of 5 days per year paid at sick pay level to contribute to a better reconciliation of work and caring responsibilities and to improve talent retention, in particular of women, on the labour market. Protection against dismissal and unfavourable treatment is provided under EU law through the Maternity Leave Directive 30 , the Part-time Work Directive 31 , the Gender Equality Directive 32 , the Directive on equal treatment between men and women engaged in an activity in a self-employed capacity 33 and the Parental Leave Directive. The protection has been reinforced by the case-law of the European Court of Justice. Unfavourable treatment of women when they become pregnant and for women and men due to take leave is still being reported in many Member States 34 . It is therefore necessary to better inform workers and support them in the exercise of their rights to ensure that they are able to enforce them more effectively at the national level 35 . The availability of flexible working arrangements can prevent workers from taking on jobs below their full professional potential and skills level or dropping out of the labour market when taking on caring responsibilities 36 . Despite the new working trends and technological developments, the majority of employees in Europe still have fixed working schedules and do not fully embrace flexible working arrangements like remote working, flexible working schedules, and reduced working hours (part-time work). The proposed Directive complements the current EU aquis in the Parental leave and Part-time work Directives by introducing a right to request flexible working arrangements for workers with children or other dependent relatives. This can significantly help to improve workers' work-life balance with a positive impact on women's participation in the labour market 37 . −a right to request flexible working arrangements for parents of children up to 12 years old and workers with caring responsibilities. - a seminar, in cooperation with the European Network of Equality Bodies (EQUINET), on capacity building activities for equality bodies and other respective labor market supervisory bodies (Network of Labor Inspectorates, SLIC) in Member States, with a focus on dismissal protection. 2. Continue monitoring the design and the gender balanced take-up of family- related leaves and flexible working arrangements as part of the European Semester and in the annual report on gender equality. 3. Improve the collection of EU-level data by Eurostat on the take-up of family-related leaves and flexible working arrangements by women and men, in cooperation with employment policy committees (SPC, EMCO) and in coordination with the European Institute for Gender Equality (EIGE). - Under the Programme for Employment and Social Innovation (EaSI) fund new pilot schemes addressed to employers for the development of innovative working arrangements such as family leaves and flexible working arrangements (through existing resources). - Ensure, together with Member States, that the European Social Fund and other structural and Investment Funds are supporting adequately work-life balance measures. −crediting of family-related leave periods in the pension system. In 25 Member States, the demand for childcare places is higher than the available supply, especially for children below 3 years of age 38 . Lack of formal care services for children and other dependants can lead workers with dependants, in particular women, to reduce their working hours or drop out of the labour market. Although the EU set the Barcelona targets in 2002 to improve the provision of formal childcare arrangements by 2010 39 , a majority of Member States have still not achieved them. The EU average is 3 percentage points below the 33% target for children aged from 0 to 3 years and 7 percentage points under the 90 % target for children aged from 3 to the school age 40 . In many cases, early childhood education and care entitlement are limited to a part-time place. School hours and school holidays are often incompatible with parents’ full-time employment 41 . Increasing the availability of early childhood education and care, out-of-school care and provision of long-term care services (including home-based services) for dependant persons will create more possibilities for women to enter or stay in employment, have a positive impact on children’s development and help to reduce the risk of poverty and social exclusion for children 42 . Investing in early childhood education and good-quality care is also recognised as an effective social investment to address inequality and the challenges faced by disadvantaged children 43 . Investing in the care sector also has important potential in job creation 44 . Similarly, in addition to its employment effects, the expansion of long-term care services can have a positive impact on the well-being and health of the carers and their dependants and lower the physical and psychological burdens of elderly care that are becoming more prevalent with an ageing population 45 . To allow parents to participate in employment, the number of available places but also the quality, accessibility and affordability of services (insufficient capacity, regional variation, distance, opening hours, eligibility criteria) needs to be considered. Childcare should be integrated with other social services 46 , such as health and employment services, to better reach disadvantaged families and children 47 . Equality between women and men, including reconciliation of work and family life and improved access to quality social services is an investment priority of the European Social Fund (ESF) 48 . ESF together with the European Regional Development Fund (ERDF) 49 and the European Fund for Strategic Investments (EFSI) 50 provide opportunities for Member States to improve their social and childcare infrastructures and address variable levels of provisions. These funds should be exploited to support the provision of accessible, affordable and quality formal care services. In addition, the European Agricultural Fund for Rural Development (EAFRD) 51 and the European Maritime and Fisheries Fund (EMFF) 52 enable access to basic services and could be further utilized. The European Semester is an essential instrument for the EU to address the economic challenges Europe faces, including employment friendly and accessible care services for parents and others who need to look after dependent relatives. This policy dialogue is important in itself but it also provides the evidence basis used to guide EU funding. - Continue guidance to Member States on employment friendly and accessible care services and monitor their provision in the European Semester and the annual report on gender equality. - Further support Member States in providing high quality early childhood education and care and step up efforts to help them learn from each other and identify what works best. - Revise the existing Education and Training 2020 target on early childhood education and care. - Improve the EU level data collection on availability, affordability and quality of care services, particularly on formal long-term and out-of school care services, with the view to explore possibilities of developing benchmarks at EU level. - Develop a tailored approach with Member States to encourage the use of the European Fund for Strategic Investment (EFSI) to finance social infrastructure, notably of child and long-term care services; including through Public-Private Partnerships. - Continue to develop the provision of accessible, affordable and quality childcare, out-of-school and long-term care services, including by using support from the ESF and the ERDF; In light of country-specific recommendations and in case of insufficient funding earmarked to address the relevant challenges identified in the European semester, request Member States to review the programming of European Structural and Investment funds (ESIF) 53 . - Explore the potential of addressing these concerns in the preparation of the post-2020 EU funding programmes, in particular drawing lessons from preparatory actions in this field. Member States' tax and benefits systems vary in terms of the financial incentives or disincentives for second earners to enter employment or work more hours, for example through joint taxation systems, transferable tax credits or deductions for single earner households. Across the EU, women account for vast majority of second income earners (or those earning less in the couple). Only a minority of countries allow for significant deductions of out-of pocket childcare expenses via tax credits or in other forms 54 . Among secondary earners, women with young children are at the highest risk of labour market exclusion 55 . This initiative aims to help Member States to remove economic disincentives that hinder women's participation and outcomes in the labour market. - Continue to identify country-specific obstacles resulting from tax-benefit systems and monitor progress in addressing them in particular through EU economic policy coordination in the European Semester and provide Commission's guidance in the appropriate form. - Share best practices with social partners and Member States through a seminar under the Mutual Learning Programme on addressing economic dis/incentives that discourage second earners from working (more). 10. Improve EU level data collection on economic disincentives for second earners; develop and use benchmarks at EU level on work disincentives for second earners created by tax-benefit systems in the context of the European Semester. The 21st Century European way of life should allow for a good balance between family and professional commitments and provide equal opportunities for women and men in the workplace and at home. EU and national legislation and policies should help employees to reconcile work and family, help companies to retain talent, promote flexibility of both employers and employees, promote equal opportunities, generate economic growth and benefit society as a whole, including children and those dependent on family care. With a broad set of complementary legislative and policy actions, this ambitious package seeks to modernise the way in which work-life balance policies are designed and to deliver measures that will improve the daily lives of many parents and carers. One of the key goals of this initiative is to enhance the existing parental leave scheme, by facilitating uptake by women and men with new measures on payment, flexibility and non-transferability. In addition, the introduction of carers' leave and paternity leave will help workers to balance their personal and professional lives. The use of flexible working arrangements is also promoted and non-legislative measures provide for more and better care facilities, as one of the essential parts of the work-life balance initiative. To back-up these actions, financial instruments will be mobilised and where appropriate, existing resources of the EU budget will be re-oriented towards priority investments contributing to the implementation of this initiative. The Commission will also raise political awareness on the critical importance of work-life balance policies for Europe's jobs and growth prospects and will continue to work with Member States to design the best work-life balance policies for their national context. There will be close Commission monitoring of work-life balance policies in Member States. Regular reviewing of a set of work-life balance policy indicators will provide feedback and inform the preparations of the European Semester and gender equality policies at EU and national levels. The success of this initiative will require a shared commitment. The Commission invites the European Parliament and the Council, the European Economic and Social Committee and the Committee of the Regions to endorse this Communication and to actively support its implementation, in close cooperation with social partners and all other relevant stakeholders at European, national and local level. The co-legislators are encouraged to reach a swift agreement on the legislative measures proposed in the package. The Commission invites Members States, Social Partners, and each relevant actor to step up their efforts in providing better work-life balance policies and allow for improved well-being of our European society. (1) Eurofound (2016) "The Gender Employment Gap: Challenges and Solutions". (2) The maternity leave Directive 92/85 was adopted in 1992 and was not changed since. The parental leave Directive was initially adopted in 1996 and partially amended in substance and improved in 2010. (4) In 2015, 43.4% of women (aged 30 – 34) had tertiary education or higher compared to 34% of men. Unless stated otherwise statistics come from Eurostat. (5) In a number of countries, the impact of parenthood is particularly high and the employment rate of women with children under the age of 6 is more than 20 percentage points lower than the employment rate of childless women (Hungary, the Czech Republic, Slovakia, Estonia and Finland). (7) The gender gap in the employment rate for the 55-64 age cohort exceeds 35% in Malta, Greece, Slovenia, Croatia, Romania and Luxemburg. (8) Working women spend on average 22 hours per week in unpaid work, while working men spend fewer than 10 hours. Eurofound (2015). (10) White paper on the future of Europe European Commission COM(2017)2025. (11) European Commission (2015) The 2015 Ageing Report: Economic and budgetary projections for the 28 EU Member States (2013-2060). (13) Brilli, Y., Del Boca, D. & Pronzato, C.D. (2016) Does childcare availability play a role in maternal employment and children's development? Evidence from Italy. Review of Economics of the Household 14: 27-51. FP 7 Project Families and Societies. (15) European Commission (2015) Secondary earners and fiscal policies in Europe. (16) See Council Directive 2010/18/EU of 8 March 2010 implementing the revised Framework Agreement on parental leave concluded by Business Europe, UEAPME, CEEP and ETUC and repealing Directive 96/34/EC (OJ L 68, 18.3.2010); Directive 2006/54/EC of the European Parliament and of the Council of 5 July 2006 on the implementation of the principle of equal opportunities and equal treatment of men and women in matters of employment and occupation (recast) (OJ L 204, 26.7.2006), Council Directive 92/85/EEC of 19 October 1992 on the introduction of measures to encourage improvements in the safety and health at work of pregnant workers and workers who have recently given birth or are breastfeeding (tenth individual Directive within the meaning of Article 16 (1) of Directive 89/391/EEC) (OJ L 348, 28.11.1992), Council Directive 97/81/EC of 15 December 1997 concerning the Framework Agreement on part-time work concluded by UNICE, CEEP and the ETUC (OJ L 14, of 20.01.1998) and to the 2008 Commission proposal for a revision of Directive 92/85/EEC on maternity protection (quoted above). (18) Already in 1992, the Council gave a Recommendation on child care (92/241/EEC, OJ L 123, 08/05/1992). (19) Between November 2015 and January 2016, the social partners were first invited to give their views on the possible direction of EU action. A second-stage consultation was conducted from July to September 2016, in which social partners provided their views on a range of possible EU-level measures. (22) Commission SWD Impact assessment accompanying the Communication "A new start to support work-life balance for parents and carers". (23) http://dx.doi.org/10.1787/9789264263420-de See for example: OECD (2016) Dare to Share – Deutschlands Weg zur Partnerschaftlichkeit in Familie und Beruf. ; "The role of men in gender Equality – European strategies and insights (DG JUST study of Dec. 2012)"
(25) See for example: Castro-García, C. & Pazos-Moran, M. (2016) Parental leave policy and gender equality in Europe. Feminist Economics, 22 (3); Duvander, A-Z & Johansson, M. (2012) What are the effects of reforms promoting fathers’ parental leave use? Journal of European Social Policy, 22 (3). (26) Except for the provisions of Directive 2006/54/EC on dismissal protection in case such leave exists in Member States. (27) Huerta, M. et al. (2013) Fathers' Leave, Fathers' Involvement and Child Development: Are they Related? Evidence from Four OECD Countries, OECD Social, Employment and Migration Working Papers, No. 140; OECD (2016) Parental Leave: Where are the Fathers? Policy Brief 3/2016. (28) It is difficult for working-age carers to combine paid work with caring duties and therefore carers may choose to reduce working hours or quit paid work. Caring may also cause burnout and stress. OECD (2011) Help Wanted? Providing and Paying for Long-Term Care. OECD Health Policy Studies. (29) Clause 7 of Directive 2010/18/EU which stipulates rules on time off from work on grounds of force majeure. (34) Equinet (2016) Responses from Gender Equality Working Group on Gender-Related Discrimination; European Network of Legal Experts in the Field of Gender Equality (2012) Fighting Discrimination on the Grounds of Pregnancy, Maternity and Parenthood; UK Equality and Human Rights Commission (2016) Pregnancy and Maternity-Related Discrimination and Disadvantage. (35) The Commission will notably support the enforcement of the existing Directive 92/85/EEC (Maternity Leave Directive). (36) Plantenga, J., Remery, C. and EU expert Group on Gender and Employment (2010) Flexible working time arrangements and gender equality. A comparative review of 30 European countries. (37) https://www.eurofound.europa.eu/observatories/eurwork/articles/working-conditions-industrial-relations/policies-to-improve-work-life-balance-0 To promote work-life balance, it is important that flexibility is employee-friendly, i.e. employees can maintain control over certain dimensions of employment such as working hours. See for example: Eurofound (2015) Policies to improve work-life balance. (38) Eurydice (2014) Policy Brief Early Childhood Education and Care. (40) No EU level benchmarks exist in the fields of out-of-school care and long-term care services. (45) European Social Policy Network (2016) Work-life balance measures for persons of working age with dependent relatives in Europe – Synthesis report. (47) To provide information to the parents on the benefits of good-quality early childhood education and care for children's overall development, cognitive skills and health is also needed. (48) EUR 1.5 billion have been allocated to the investment priority 'equality between women and men' which is broader than work-life balance. (49) ERDF supports investments in early childhood education and care infrastructure of EUR 1.3 billion in the 2014-2020 programming period. (50) The European Fund for Strategic Investments (EFSI) is helping to finance infrastructure and innovation projects as well as small and medium-sized enterprises (SMEs). Private care services could get funding under this latter category, "the SME window". (51) EAFRD can support investment in basic services including childcare facilities and elderly care facilities. (52) Care services may also be supported by the EMFF through community lead local development measures (Fisheries Local Action Groups).